Former British Heavyweight Boxer. On his official site, the 'tale of the tape' has him at 6ft 5, 84 inch reach and on twitter in 2013 he said "I'm 6-5" although in mid 90's he was reported in newspapers at precisely 6ft 4.75. In 2004 though in a sports illustrated Q&A talking about Collegiate days: "Then, seeing 6-foot-8 guys as guards, well, I'm 6-foot-3 and I'm a power forward". 6'5 in his youth. 6'4 as old man. Nowadays he may be closer to 6'4" than 6'5"! I think anyone who says that Lewis is under 6 foot 4 is nothing but an imbecile . Lewis was 6 foot 5 at age 25 . Today he is at least 6'4.5" . We Know Holyfield was a solid 6'1 guy in his prime. Lewis looks at least around 2" taller. 6'3 always seems a bit too short for me but in his fight with Tyson he did not have Tyson by no 6". No Way. Lewis I think would be 6'4 on a good day, not taller. Wilder is 6'6.5" Tops and looks taller than Mr. Lewis by more than 2" alot of the time. Here is Lennox, Gerry Cooney, and Riddick Bowe standing together. Looks like they are all within 1 inch of each other today. Rob, how tall does Mikey Garcia look with Lennox? He can look 169-70cm range just that moment...although comparing head sizes, Lennox looks at least 2 inches longer (maybe slightly nearer and tilting down a bit lengthened it to 11 inches). @Myself: kiwi may be 193.2 or something most of the day. He doesn’t lose a lot as is. I lose 1.9cm on average sometimes 1.8-2. If he’s only 193 at a low from 194.5 then most of the day for him would be about 193.2 or 193.3. You don’t lose virtually anything after about 7-8 hours of being awake on a normal day. If anything maybe a couple more mm. You can't be 193.5 for most of the day if you wake up at 194.5...I wake up at 194.3 and am between 192 and 192.7 for most of the day, depending on the activity. I think Charles Barkley may have a small fraction on Lennox. Rob,I suggest you to add Riddick Bowe on this website. Rob, do you have any guess for Lewis's former Manager, Kellie Maloney? Editor Rob: not familiar with her. Never seen a man downgrade his own heigth so low. Editor Rob: you mean the 6ft 3 college quote? I suppose Lennox did gain some height during 19-20 range. He has very long legs...Which one do you think is your inseam rob? peak = 6'4.75" , current = 6'4.5" . @ibra. Lewis looks a bit taller to me imoClick Here think Lewis is 194-195 while Strahan is 193. Rob, did you see the photos of Lewis and Strahan ? Strahan didn't look shorter than him. Rob. you only have Lewis and Wlad 0.5 of a inch apart. Click Here. Wlad looks at least a inch taller. Lennox 195cm and Wlad 198cm seems more accurate. But heavier in later carrier because of body fat? Editor Rob: yes, a bit of extra fat, not much, but enough to push him over 255 pounds at one point. Editor Rob: 240-250 range, although I'm sure he's been a bit heavier later in career. Holyfield was measured at 6-2.5 but probably in boxing shoes. Holyfield looked a easy 6-2 to me at peak and Lennox was like 3 inches so 6-5 at peak. he looks shorter than that nowdays to me. 6-4.5 still i would say at the least still. Lennox Lewis can look a bit shorter nowdays to me. i think Lennox Lewis was a legit 6-5 but look a bit smaller like 6-4.5 nowdays. Editor Rob: maybe, some guys reach that range without anything lost, others have already began shrinking. Two inches shorter than 6'7" Vitali Klitschko in their fight. I'd say 6'5". Just saw the BBC sports website showing the clip of the 'sports personality of the year' awards etc and there was one with Andy Murray and Lennox Lewis. I only came here to check their heights as Murray looked far smaller then Lennox...I'm surprised to see the difference isn't all that great in reality. I wonder what boots Lennox was wearing. @nick how can they both me 1 height if 1 guy is taller than the other? rob, when you give a listing of somebodies height, do you do it bare foot? or with footwear?? Editor Rob: barefoot is the idea. This page needs to be updated as it is with its last post from 2007. Editor Rob: here's a link to Lewis and Joshua to give a sense he is shorter than Anthony...how much is debatable. Closer to 197 cm than 195 cm. Holyfield is 6'1, No Taller. Lewis has him by 3 inches tops. Lewis is 6'4 on a Good Day. Lewis was shorter then 6'5 Anthony Joshua ( Check this Site) but a Solid Inch, likely more. Looks the exact same height as Charles Barkley. He also was measured and claimed 6'4.5 and 3/4. So 6'4 1/2-3/4 same range Rob is close enough! Looks much bigger than Holyfield in that photo. I think 6'4'' to 6'5'' is probable. How Holyfield more or less held his own with these big guys is beyond me. They've listed him 6ft4.5 at some point in boxing as well, though I agree with this listing. and here: Click Here 1,96 (6-5,2) isn´t enough für W.K., more 1,98 (6-6). Why do people constantly doubt and downgrade someone's height?? Lewis is 6'4.5in give or take, he had nearly 2 inches on Frank Bruno who is 6'3"
Rob, how tall do you think Hasim Rahman is? His 6'5" claim seems legit. Completely towering David Beckham here. he looked clearly 17-18 cm taller than tyson. he towered on tyson, a big difference between the two. tyson is 176-177 cm. Lewis is 193-194cm. Everybody knows that tyson was overestimated for all his career, listed a fake 5'11". He was at least an inch, an inch and half shorter. For sure. He didn't look 17 cm taller than Tyson. Lennox had a real heavyweight bodyframe. The best heavyweight of the last 20 years. Lewis peak was in the 6'4" range(193-194cm). 6'3" is a little bit underestimated, just like 6'5" a little bit overestimated. And yes revious83, the overestimated haye is max 6'1". For sure. Rob do you know what time of day he was measured 195cm? He looked more like a flat 6'4 when he appeared on Johnathan Ross in 2005. Certainly he did not look as big as Vince Vaughn or Husain bolt did next too ross. Why does he only claim 6'3? How do you guys explain the video i posted in the vitali klitscho page, where david haye is standing 6' in shoes next to a height chart? Could he really be that low? Lewis never really looked under 6'5 in his boxing career. Oddly enough however he was listed as 6'4 during his amateur career, but truthfully i highly doubt he is a flat 6'4. He was 4 inches taller than 6'2 listed (but probably closer to 6'1) tommy morrison, only an inch shorter than 6'7 listed michael grant, and only about 2 inches shorter than Vitali Klitschko. Between 2 and 3 inches between Vitali and Lennox. Fight from 2003 and Vitali is looking 6 ft 7 and half in comparison. Here is Lennox Lewis with David Haye. If Lewis is 6 ft 4.75 in then Haye is max 6 ft 1 in. He doesn't look 6'5 with emanuel steward, more like 6'3.5. Lennox Lewis was ecactly the same height as Eddie Cotton in 2002 when he fought Tyson, who said he is big at 6 foot 5. He looked the same as 6-5 Tucker. He is very tall, but i think not more as 6-5. 6 foot 5 sounds right! Everyone according to you guys is much shorter than they claim. Some of the posts I see here just make me laugh- Haye is under 5'11"? Are you for real? That guy isn't 6-3 I agree but he isn't a millimetre shorter than 6-2.
lennox reach is 84 inches do u realize how long his arms would look if he was 6foot 3 you guy have a desire for your idols to be close to your height is what this is you guys are sad there are so many average height stars all dont have to be average get over this!!! Are you sure Haye is not under 6' 2" Shaun? He's under 6 foot in trainers according to that clip I posted. Talk about surprising! Is he really 5' 11"? If you pause it at 38 secs or so, you'll see Haye stands next to the height chart and comes up under 6 foot in trainers. Isn't that interesting?! maybe i own lennox 1" by saying 6-3 ,but lennox is not 6'4.75 and not close to 6'5 at all , he is tall but probably 6'4 top since mike tyson is only 5'10 but on the old match with lennox he listed 5'11 on the ring. for lennox 195 - 2 = 193 > 6'4 , lennox might be max 194 a less chance. he is 6'3. looks it as a small cast in rocknrolla. with fake 5'8 G guy he look 6'3 as well. amir khan is more likely to be about 5ft 9 or 5ft 9.5 google his image of him standing face to face with an american boxer called lamont peterson who is listed as 5ft 9 on boxrec. Lennox could be anything above 6'4 and below 6'5..
Haye is not under 6'2". He suffers from the Darius Danesh Syndrome, claiming 6'3". This guy looks easily a legit 195cm. Rob how tall would you pin Amir Khan if he had a page on here? Haha well I must admit I say "about 5'10" also..or "about 5'9-5'10" the difference is im a legit 175.5cm night height..if hes under 175cm how can a guy even claim anywhere near 5'10? What would u list him at on this site by your opinion not what he claims? 123, go * yourself. I met, spoke, got autograph, and shook hands with the man. Shut your *. Man, you should be banned from this site, you are unreal. Y u so jealous? This is a Lennox thread, not a shoes or barkley thread, go elsewhere. You lie, lie, you liar. He is 6'5 tops and I know that, so there. the word 'LIE' does not enter my vocab. You lie! cos you don't know people round this area. Now, I feel so glad that I met him. GOD how tall are lennox's security? 123, FYI, he did live in North London, not far from me in Hadley Wood. I didn't come here to lie about something like this, but to share my experience. So next time, don't be so hasty with your words. This was in 1994 when I was 16. But for aruguements sake he IS his stated height. Just for the record, I met Lennox Lewis in person at my local supermarket (ASDA ,Southgate, North London) when I was 16 years old. He is definately not 6'3" and I gave him about 1.5" more than me, so I think 195cm is pretty bang on for Lennox. Stop this b.s. He is not strong 6'5, he is exactly 195cm tall, because he is same height as Charles Barkley who is 195cm too (could somebody post this photo again?). Lewis's musculature certainly underwent a remarkable transformation after his late twenties. It is possible he gained a little height in 'the process' (Evander Holyfield did). Amir Khan is 5'8" at best, but claims 5'10". Next to David Cameron, he appears 5'8". Cameron is in the 6'-6'1" range. Actually both khan and la hoya are 5'8ers. haye dwarf him by 5 or 6 inches, he is 6,2 and de la hoya is 5,9. Heres dsvid haye with oscar dela hoya. Dela hoya claims 5'11 but on this site he is listed as 5'9 and with alot of posters believing he is 5'8. So 5'8-5'9 is his height range and haye usually has 4 inches on him but haye is usually standing fully erect and dela hoya always has his head down. Footwear isn't visible either. do you agree Rob with 6,2. Again, heres haye with the less then 6'1 jonathon ross. Jonathon ross claims 6'1.5 so lets just give him that. Jonathon ross is leaning, i dnt knw why the hell he is even doing that, it has not purpose and isnt even funny, chances are hes trying to joke around act like he isn't taller then the others ''look im a shorty'' but even then, imagine him standing straight, wouldn't he even surpass hayes height? it looks like he clearly would but even if he were the same height as haye, that would make haye a maximum of 6'1.5. Jonathon ross isnt listed as 6'1.5 on this website, chances are he is shorter. That would further reduce hayes height. As i said, earier, i dnt believe haye is 6'3, or 6'2, i believe he is less then 6'1. That is jimmy carr on the left, he isn't that tall but compare him to haye, he isn't that much shorter. 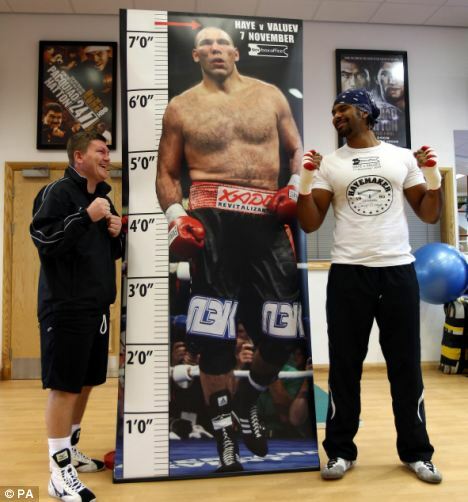 Heres haye with 5'8-5'9 wayne rooney. Tell me, even with rooney leaning, how much taller then him is he? If i were to call rooney 5'9, rooney reaches mid eye level with haye and i were to measure to the top of hayes cowboy hat even that could give haye a max height of 5 inches extra thus 6'2. But, rooney is leaning and hayes height does not include his cowboy hat. The top of his head would be around the gold band level of his hat and if rooney were to straighten then the difference wouldn't even be 3 inches. Making haye less then 6'0 in comparison to the 5'9 listed rooney. In his most recent fights, the announcer has stated 6'5 and on the conan show, wladimir admitted to only 6'5 and on his website it states 6'5. But like i said, in alot of the pictures, even with wladimir at 6'6, haye struggles with 6'2, he is less then 6'2. I think in alot of boxing forums theres debates about his height. I mean, in pics he can look taller but in alot of pics he looks alot shorter and u can make yourself look taller then you are but certainly not shorter. Rob should you not have a david haye page? that is a bad camera angle in your picture here is a better pic Click Here or here Click Here wladimir at 6,6 he claims 1,98cm wich is 6,6 and david haye is 6,2 how tall do think is valuev if david haye is only 6 feet he had not a full head on david haye. I do believe lennox is 6'4 and audey a bit taller, 6'4.5 to 6'5. And i went by what wladimir said about his own, ''im 6'5 tall and my brother, 6.6.5''. However even if we were to put that wladimir at 6'6, how tall would it make haye even in this picture. As you can see, they are both perfectly straight with footwear to be seen. wladimir has dress shoes on and haye sneakers with 0.6 inch lift. Wladimir shoes are probably around 1.2 but even with the footwear advantage and wladimir at 6'6, how tall is haye? Does he look 6'2 even? As i said before, out of the all the boxers, david haye is not his listed height of 6'3, others can be believable. David is 6'1 or under. Kobe bryant has close to 5 inches on 6,1 Obama so under 6,5 for kobe is not possible. Thats exactly my point, listed! Lamaar seems 4 inches taller then kobe, who claims hims 6'4 and most likely is around 6'4 and half. That would make odom, 6'8-6'8.5. Vitali is around 1.5-2inches shorter then odom. That would make vitali around 6'6-6'6.5 feet tall. Thats exactly the height is brother wladimir puts him at and he turn, puts himself at 6'5. 6'8 is not his height and nor 6'7 most likely. I did mention haye at a possibly 5'11 but, 6-6'1 is most likely his real height, not his listed 6'3 and nor 6'2 judging by how he is towered by guys like audley and wladimir by more then 4 inches, most likely 5! Audley has been listed at 6'4.5 and also around 6'5 and wladimir gave his own height at 6'5, both have the same height advantage over haye thus both are realisticaly around 6'5. Either way, haye does not measure 6'3 in comparison to them, nor realistically 6'2. 6'1 would be his max estimate and he could be as low as 6'0. He has a proper built frame but still doesn't weight that much for a heavy weight, around 98kg, he would weigh more if he were 6'3 with that muscle and mass, i weigh around the same weight as haye and look similar, and i'm only 5'9, i doubt i have a heavy bone structure. But as far as the rest of my list, thats the only adjustment i would make, haye 6'0-6'1. Lennox could be a weak 6'4 but i cnt put him close to 6'5. but thre are not accurrate vitali looks 6,7 to 6,8 with 6,10 listed lamar Odom.And david Haye is minimum 6,2 6,11 valuev didnt have a full head on david haye which he should when david is only 5,11 that makes your list pointless. I do powerlifting, dnt need to take up any other sport. Anyway, your point only relates to tall sports ie basketball and volleyball, it does not relate to boxing. Its not like i am arguing that a basketball player cnt be 6'6 plus. Further, your 5000 guys won't be in the movie and entertainment industry either nor your 6'4s, 6'3s, 6'2s since those heights aren't neccessary and are rarer but that doesn't stop individuals from claiming them, john wayne 6'4? If he was really 6'4, he wouldn't be able to carry his roles. Man, how the hell can you put vitali at 6'8? :S you really need to reassess your perspective on height. And david haye, is not 6'3 not 6'2, audley harrison dwarfs him. Lewis himself has stated 6'3 but ok, lets give him 6'3.999999. As i see it, theres two type of annoying personalities on here, one the short guy with the napoleonic complex, downgrading and being biased on every listed height out there and then theres the annoying tall guy who upgrades every height close to his own but not above, just to create a special group where he thinks he belongs to with his imaginery cyber celebrity clique and no ones invited to, and sees the shorter guys trying to claim as thier own. I think you belong to the latter, big94cm. You have to understand, 99% of the people commenting on here will be less then lennox lewis's 6'4 height, and 50% of those will be naysayers, you could use the jealous short guy argument on all of them since most of them will be shorter then lennox! I stated my boxers height list and those i believe are accurate. your list is crap johno david haye is minimum 6,2 and vitali is no way only 6,6 when you look him with lamar odom he is atleast 202 cm and lennox lewis 1,95 or 196 cm . - Its funny how sometimes people derive others heights by comparing them to a certain individuals height and inturn, that individuals height is determined by comparing them to the first individuals height. Its happening alot on this site. Eg lennox is 6'5 because he's 1-2 inches shorter then audley harrison whose listed at 6'6 and inturn, audley must be 6'6 because he is 1-2 inchers taller then lennox who is 6'5? I mean, they are both dependent on one another and it dnt make sense. Audley has been listed in some quarters as 6'4 and half ie 76.5 inches, to me he is a legit 6'4, one of a few including kobe bryant and usain bolt. True giants. People, go and measure someone who is very tall who claims to be 6'4 with a tape measurer, without shoes and chances are they will be 6'2. But since nearly every other person in society claims a height 2 inches above thier real height, there is so misinformation and to the casual observer an actual 5'10 is thier 6 foot! and 6'2 is a 6'4 and so forth so when there is a possibility that lennox lewis as stated himself could be a legit, 6'3 giant no one believes it because they cross reference with thier false idea of a 6'3 individual and think its miles too short, when it isn't. As a legit 5'9.2 inch individual and not a false 5'10 and 5'11 individual, a 6'3 person is likely the tallest individual i will see in a day in east london. At work, outside, at the gym. It is not common at all. I go to fitness first, been there 6 yrs, go 4 times a week and only 3-5 times have i seen someone who is 6'5 and over ie 77 inches out of thousands of individuals who would happen to train whilest i'm there. Lennox looks little tiny taller than Sanders, so 6'5 is stretch. 195cm sounds leegit. Lennox Lewis stands next to Audley Harrison who is a legit 198 cm. David Haye does not look taller than 187 cm. He is definately not 6'3! He listed here at 195cm, so i don't downgrade no one. And by the way, Vitali listed 2meters tall on his own site. But i think he is 202cm. And Lennox is a good example of 195cm tall guy. lennox is a full 6,5 he isnt much shorter than 6,8 scottie pippen. Haye does look under 6'3 next to him. Lewis 6'5'' although I heard his trainer claim he was 6'6'' which I doubt. Was about 2 inches shorter than Klitschko when they fought. Never looks that short nrxt to Hagman. Was not wearing big heels in Jeanie. Very strange. Mark D., 195cm is not under 6'4". It is closer to 6'5" you joker. And I would pay a legit 6'6" for Lewis. 195cm? That's under 6'4". Impossible. I would definitely say 6'5". He looks 2" shorter than 6'7" Vitali and 1" shorter than 6'6" Wladimir. He looks 2" taller than 6'3" George Foreman and 3" taller than 6'2" Evander Holifield. Lennox could be 6'6" because he has a clear inch on Charles Barkley who is at 6'4.75" as well on CelebHeights. The pic with Barkley and Lennox can be seen at Lennox's official website. Woah, Lennox looks like a beast beside Glenn, so I guess Lennox is a strong 6'5". And I saw a match where he fought Vitali Klitschko and there wasn't a big height difference between them. I only estimated Vitali an inch taller than Lennox. I also saw several interviews with Vitali and there he didn't seem so tall that we could list him as 6'7.5", I always estimated Vitali as a strong 6'6" or almost 6'7"
OK, Lewis looks 6'6" beside Glenn. James, what height would be abnormal for you? 6ft 4.75 is perfect for Lewis. Woah, Lennox looks like a beast beside Glenn, so I guess Lennox is a strong 6'5". And I saw a match where he fought Vitali Klitschko and there wasn't a big height difference between them. I only estimated Vitali an inch taller than Lennox. I also saw several interviews with Vitali and there he didn't seem so tall that we could list him as 6'7.5", I always estimated Vitali as a strong 6'6" or almost 6'7". Glenn is very far back in that pic. Move Glenn forward a biT and the top of glenns head would be level with lennox's upper lip. Theres about 7 inches between lennox's upper lip and the top of his head. I would give lennox 6'3 and 3/4s inches in height. 6'5 is an abnormal height and extremely tall. The individual starts to look lanky despite having lots of lean muscle, lennox doesn't seem that. He is clearly taller than 6-3, but he is only a bit taller than 6 3.5 Krasniqi and i think he was only a bit taller than 6-3 bruno, so I think he is 6.4 to 6.5. Are you people blind? Ofc he is not 6'3...that's just hillarious. He is 6'5" or 6'4.75"
Lenox looks 6'6" beside Glenn. 6'4 3/4" is definitely downgraded. Lewis is at least 6'5". If he's really 6'5" or more then why should he have said he's 6'3"? He's exactly 1m95 , he's been consistently listed as this. He can look taller though , due to his huge build and good posture. I have seen him and i think he could well be 6'5 or 6'6. I remember noticing just how huge his fists were. He looked as if he could easily punch through a brick wall! Look 6' 5.5" in the photos on his website. He towers over nearly everyone. Lewis needs an upgrade. There is no reason for him to be listed below 6'5". I've heard him on numerous occasions actually refer to himself as 6'6" when commentating on HBO. He obviously isn't 6'3" so the above quote is out of date, and simply innacurate. Lewis stacks up fairly well with Vitali Klitschko, who himself is no less than 6'7.5" as I have photos of him post fight with Timo Hoffmann who is a legit 6'7" and Vitali is clearly taller. And as ed2 points out he is as tall, or marginally TALLER than 6'5"-6'6" Trace Adkins, so again 6'4.75" doesn't work. Finally, he is medically recorded as 6'5" on the tale of the tape, and in some english broadcasts I have seen 6'5.5", and 6'6", and on boxrec, the international database for pro boxers, he is listed 6'5". The man has an 84" (7'0")... he is a huge man and I will put him at 6'5" at the MINIMUM from all my experience with this sport. CoolJ, I argued this on the Conan O'brien page about Wlad stating his height as 6'5" to be inaccurate, despite coming from his own mouth. He has been listed minimum 6'6" throughout his career, for I have seen all of his pro fights, and have seen him appear noticeably taller than 6'6" Ray Austin, and 6'6" Jameel McCline, and a plethora of others around 6'4" whom he towers over. Maybe he is confused about the conversion for i'm sure he is used to using the metric system. Wlad Klitschko said recently on Leno that he is 6'5". Pro boxers exaggerate their heights just like all other pro athletes. Well, what's a quarter inch? Close enough to 6'5". all though 1m95 is actually closer to 6'4.75 than it is to 6'5". And 1m96 is closer to 6'5.25 than is to 6'5". I know you guys are very technical re: height, but 'mon now Lennox is enormous in this pic and not even standing erect. Giv'em the 6 5 and run away before he clobbers ya! How is he in person? Golota is an easy 6'4". He is very large, and i've seen photos of him with 6'3" guys and he is clearly taller. golota is at least 6`4? I always thought 6`3ish. thanks glenn. i just got golota.at least 6-4. He was taller than golota AshnarLynx. But is Golota a legit 6`4? He was listed as 6'4.5" in his eirlier fights. That seems just about right. Lewis didnt look much taller tah Bruno. Standing next to Bruno or Luan Krasniqi he lookes 6`4 , but beside Glen, I would say it could be more. I think Lennox has weighed more than Shaq since he retired. ^o^ Still, I think he'd be about 6'6"(+?) and a bit if he straightened up completely. He's got these ridiculously long arms and wide shoulders, so he looks way taller than 6'4"-6'5" or so. Boxers always have slumped postures...just habit. I saw him in the West Village with his crew a couple years back and he looked enormous, even next to his 7' tall bodyguards. Vitali Klitschko is sometimes listed 6'7" or 6'7.5", however he is 6'8" and Wladimir, his brother is 6'7". They are generally underlisted slightly, I don't know why, but they are always taller than they should be as listed when face to face with other big men. Example, Vitali had 1" over 6'7" Timo Hoffmann. Wladimir had about 1.5" over 6'6" Jameel McCline. Lewis fits at 6'5", based on being about 3" shorter than Vitali. If Lewis is anything other than 6'5", i'd say it's slightly higher actually. Looks about 6'5''. Big guy. He is certainly more than 6'3''. When he fought 6'2'' or 6'3'' guys like Frank Bruno of Frank Botha, Lewis was noticeably taller. The only guy that really looked bigger than him was the 6'7'' or 6'8'' Kiltschko. That was a great fight that the ref shouldn't have stopped. Either could have been KO'd at any point. He is 6'4. I saw a photo with him and Golota, they looked exactly equally tall. Lennox Lewis looks 6'5'' in the picture. He isn't standing straight. Like Derek said we aren't going to be able to tell the difference from 6'4 1/2 to 6'4 3/4 to 6'5 based on a picture unless we were there up close we could maybe tell the difference. he looks 6'2 or 6'3 by slouching. But he looks around 6'3 or 6'4 range. Sorry you guys got this one wrong, he is clearly 6'5". He jus has bad posture. In this picture he is slumping a lot. true anonymous.true.i learn new things on this site all the time. (Jude Law saying he's 5'9"!). I always thought in the ring he appeared taller still than the 6'4" boxing sources have generally listed him as being. Based on this photo there's no argument - Lennox Lewis is 6'5". And while we're at it, look at that gigantic fist. Mike Tyson got caught and knocked out a few times, but the methodically savage beating he endured at the hands of Lennox Lewis was unprecedented. 6-3? wow.i saw 6-4.5 or 6-5.he is 6-5. Glenn, his saying he was 6'3" may just be a reflection of the modesty and lack of height consciousness many British celebs disply. I always thought in the ring he appeared taller still than the 6'4" boxing sources have generally listed him as being. Based on this photo there's no argument - Lennox Lewis is 6'5". And while we're at it, look at that gigantic fist. Mike Tyson got caught and knocked out a few times, but the methodically savage beating he endured at the hands of Lennox Lewis was unprecedented. Sure looks 6'5" with Glenn. Even if he is a tad under, it's impossible to tell 6'4 1/2" or 6'4 3/4" and 6'5". Wow, I always took him for a 6-4 guy. But he looks like a giant in this pic! 195 cm at the least, going by glenn's photo. He is a real big tall man. I suppose the ground is not flat. Anyway look at the shouders difference. Near Glenn he seems a 2 meter man. "In the photograph Lewis looks 6'7'' next to 5'8'' Glenn." LOL He looks 194-195 cm. thanks atoadaso.your input was good. Lewis is not shorter than 6'5" for sure. He was nearly the same height as 6'7" Michael Grant, and was only about 2, or 2.5" below 6'8" Vitali Klitschko. Vitali Klitschko was way taller in promotional pictures of him and 6'6" Jameel McCline. As well, he looks 6'5" with Glenn here for sure... and i'm 6'5" as well so I can tell this easier. Shaq has the same amount of height on Lewis as Lewis does on Glenn. He was sometimes listed at 6'4 3/4'' in his older fights ... and that was probably in 1/4'' or so boxing shoes. Oh ... he said 6'4''-6'5''. so lewis is/was never the 6'6 he was billed at? I always thought he looked more this height when he fought tyson who clearly isn't 5'11. Glenn said he looked 6'4'' on the Tyson page. I've always thought he's 6'4 1/2'' ... but what's a quarter inch! Shaq did dwarf Lewis. Well to me 7 inches is a dwarf. But he may be a full 6'5. 6'4.5 at the very least he is. Vince is 6'6.75" in shoes and leaning. Vince is taller but not by much. Shaq is leaning so much the picture doesn't mean much. vince has 1.5" basketball boots on there and lewis we don't know footwear, could be wearing converse. Carter and lewis are the exact same height there. I'm sure 7'1" Shaq did dwarf him because Shaq dwarfs 6'5" Kobe and 6'7.25" Magic Johnson. Vince is leaning a bit but he is barely taller than Lennox. 6'4.75" seems right. Saga - he is that big. He has been in the ring so many times with other boxers that it is pretty clear. Frank Bruno was about 6-3. Your George Hertzberg pic has him exactly a head taller than Rob. Lewis is almost a head taller than Glenn in the picture but he's obviously in a relaxed pose looking down at the camera. Given that his head in probably 9 to 10 inches long, I'd say just under 6-5 is right. i think you can give him the full 6'5 rob :) even shaq didnt dwarf lewis. nice picture too i wouldnt wanna mess with him! Id give him 6'4.5 just to be precise! Lewis looks 6'4.5 at least. Close enough to 6'5 to call it 6'5. I think he is a legit 6'5" in this picture, and Austrian is right he is not shorter compare to the Klitschko Brothers. That was not his measured height i remember it was Jason, who estimate that Lennox Lewis measured height was 6'4 3/4". hey glenn, what did you think when you met him? Taking into account he has ground advantage and he's slightly closer to the camera i don't think he looks 6'4.75 at all. In my opinion he looks just over 6'3, possibly 6'3.5" but i can't see him over 6'4 here. again,same damn position in front of a hotel where the elevation is slightly higher before the steps.he has the advantage,but it should only be a half inch.this same spot catches me alot. Looks at least 6'5" in the pic with Gleen above. I saw Lennox once in Vegas. Looked more or less about 6'5" to me. Maybe just a hair under that, but hardly enough to be quibbling like this over. The 6'5" listing looked about right to me. She came up to my armpits in heels, she's really small. Looks fantastic for her age, probably more so than any actress I've ever met.